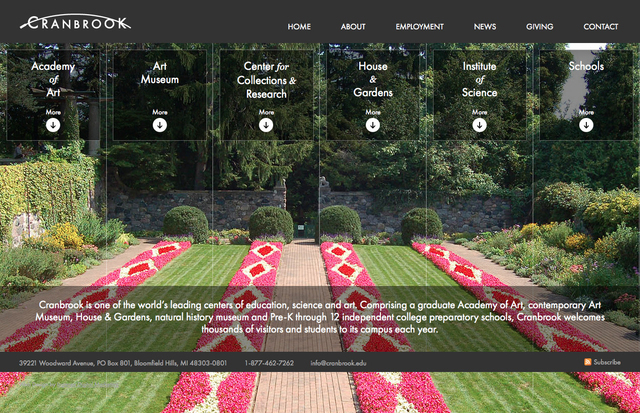 The new Cranbrook Educational Community website, designed by Ingenex Digital Marketing, can be viewed at http://www.cranbrook.edu. (PRLEAP.COM) Cranbrook is one of Michigan's premier educational and research facilities boasting schools, art museum, science institute, art academy, house and garden, and archive collection. To build on the heritage and prestige of Cranbrook, Ingenex Digital Marketing has designed and launched a new web site for www.cranbrook.edu. The new web design created by a leading Michigan web design company features many beautiful photos of the Cranbrook campus, as well as improved navigation and usability. "Ingenex has been a valued partner with Cranbrook Educational Community," said Stephen Pagnani, Head of Communications at Cranbrook Educational Community. "Their ability to capture the essence of an organization through stunning web design, and to build websites that are user friendly and simple for us to manage internally, yet diverse and powerful in their functionality, has made them a valuable partner for us." The new web design enhances user interaction while providing a more streamlined user experience. Cranbrook now has a mobile-ready website that can be easily accessed on smartphones and tablet computers. Ingenex worked closely with Cranbrook to develop a design that would best suit them and the needs of their community, while creating a web experience that would enhance the user experience for all Cranbrook Educational Community families, donors, members, and alumni. "The website turned out to be a beautiful and effective portal to represent Cranbrook Educational Community and allow users to easily access the resources and other websites at Cranbrook," said Derek Mehraban, Ingenex CEO. "We enjoy working with the talented team at Cranbrook and helping them achieve their goals through successful online communications. " The new Cranbrook website allows users to easily access the latest information from all areas of the Cranbrook Educational Community; as well as information about employment opportunities and charitable donations. Ingenex works with select educational clients, non-profit organizations and corporations to showcase their brand online and help them achieve their marketing goals through digital marketing. This includes using inbound marketing to drive traffic and conversions to websites. For more information about what Ingenex can do for your business, visit us at http://ingenexdigital.com. Ingenex Digital Marketing is a Web Design Company based in Ann Arbor, Michigan; delivering a full suite of digital marketing services since 2006, including: website design, social media marketing campaigns, Google Analytics, search engine optimization (SEO), pay per click advertising (PPC), digital public relations, and mobile applications development. To learn how Ingenex can help you connect with your customers, visit us at http://ingenexdigital.com or give us a call at 1-855-INGENEX (885-464-3639). Cranbrook is one of the world's leading centers of education, science, and art. Comprised of a graduate Academy of Art, contemporary Art Museum, House and Gardens, Institute of Science, and Pre-K through 12 independent college preparatory Schools, Cranbrook welcomes thousands of visitors and students to its campus each year. Learn more at http://www.cranbrook.edu.